BlackBerry Desktop Manager 6.0 Released | BlackBerry Blast! 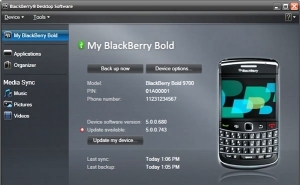 RIM has released an update to their BlackBerry Desktop Manager software taking it to version 6.0. The release is for Windows so Mac users will have to wait for a Mac version. The new BlackBerry Desktop Manager adds new features and has support for the BlackBerry Torch 9800. This version of the Desktop Manager comes with a new user interface that you will notice immediately.